Baldwin's Restaurant was first founded in this location in 1876 and soon became a saloon, still in the midst of the gold rush days when the Dalles had some 30 saloons. 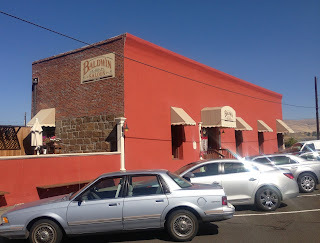 The building hosted a range of non-bar businesses for most of the 20th century until 1991, when Mark and Tracy Linebarger purchased the building and refashioned it into the Baldwin Saloon again. The Dalles, Oregon was named for the French word for "slab" ("dalle"), inspired by the flat slabs of rock that populated this part of the Colulmbia river. The locals will tell you that the city was the true termination of the Oregon Trail, as gold miners and other emigrants ended the land portion of the route here and floated the rest of the way to the coast down the Columbia. The current Baldwin Saloon offers a large menu of mostly traditional American favorites made from scratch, with an occasional anomaly ("Chef Tammy's Thin Mint rubbed lamb roast!"). They have a very nice selection of craft beers and their cocktails -- well, let's just say the cocktails are not among the many reasons it is worth going out of your way to stop by. Above the dark woody booths and wainscoting and around the attractive, antique, mahogany back bar the exposed brick walls are covered with period oil paintings, with the focus on a growing collection by landscape artist John Englehart. The owners were not afraid to take an ethical stand on the 2017 "Day Without Immigrants," and include a few offbeat attractions. Perched on a ledge high about the tables is an 1894 Schubert mahogany piano, which includes a live pianist on weekends, described thusly: "Caroline Homer, 78, who's been playing an 1894 Schubert piano at the Baldwin every Friday and Saturday night for 20 years, except when she goes elk hunting." 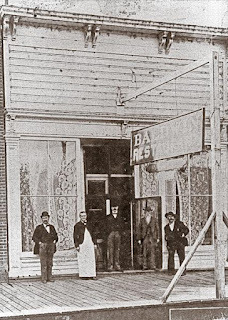 "It all began in 1876 with the Baldwin Brothers, James and John, as the original proprietors of the Baldwin Saloon. With the railroad right out front and the Columbia River nearby, business at the Baldwin Saloon kept the two brothers busy, as it was said to be the headquarters for the many men who worked the river and the railroad.Following the era of the Baldwin brothers, an interesting fellow by the name of Dr. Charlie Allen operated a saloon in this same building. Allen was an arrogant man who used the title “doctor”, although his previous occupation consisted of simply selling and adjusting eyeglasses.Allen insured his time spent at the Baldwin Saloon would go down in history when he had caduceus (medical insignias) included in the cast façade that trims the original front of the building. This cast iron façade was made specifically for this building by Golden State Iron Works in San Francisco.During the ownership of Dr. Charlie Allen, a brothel in a small frame building was attached to the back of the saloon. The operator of this establishment later married Allen, and they operated their businesses together. Photo from Wasco County Pioneer Assoc. 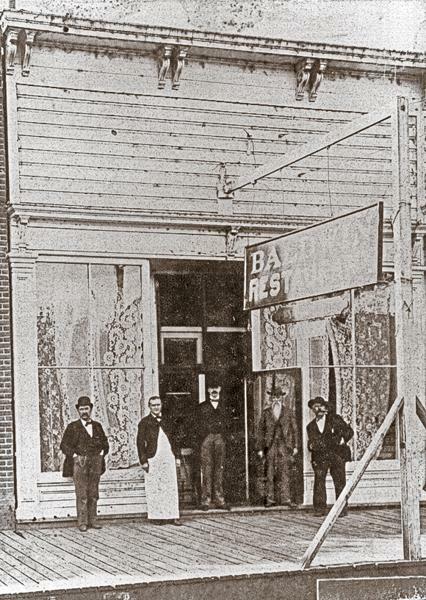 The Baldwin Saloon’s history is forever in the making. 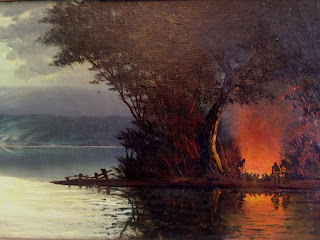 As additional Englehart oil paintings are acquired and historically significant pieces are found, they will continually be added to the collection that makes the Baldwin Saloon so unique. This is a building whose spirit will live on forever."